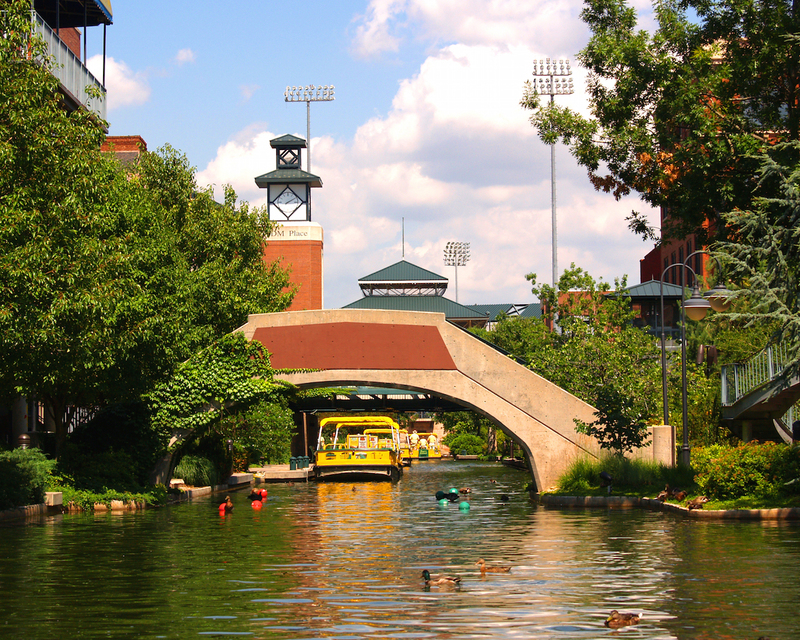 If you’re visiting Oklahoma City, don’t miss out on Bricktown. It’s a lively entertainment district tucked inside of an industrial-chic type area with old warehouse spaces they’ve turned into homes, restaurants, shops and more. If you want front row tickets to the scenic route, purchase yourself a water taxi ride. 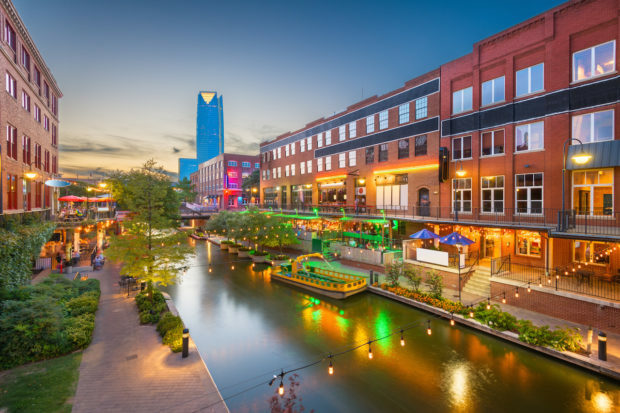 It will take you on the canal of Bricktown, which is smack dab in the center of all of the fun things to do in Oklahoma City. Rides are available all year long. It’s especially nice during the winter season because you can see all of the lights and decorations on display. You’ve likely heard of a party bus. But what about a bike bar? It’s a 16 passenger bike you and your friends pedal on. (Don’t worry, the company also sends an official designated driver to supervise the ride and do the majority of the steering and hauling.) Your bike bar tour will make 3 different 20-minute stops at local bars during your two-hour tour ride. You can go during the day or night. On the bike, there will be a cooler for you to store extra wine, beer and snacks. If you have something a little cozier in mind- say a party of two instead- take a horse-driven carriage ride down the streets of the district. What’s better than a little All-American baseball, a fist fill of mustard-smothered hot dogs and a lap full of ball-park pretzels and nachos? So, take yourself out to a ball game! At the Chickasaw Bricktown Ballpark; Home of the Oklahoma City Dodgers. See them in action anytime between April and September. Still hungry after the ballpark? There are many restaurants in the area to choose from. At Toby Keith’s I Love This Bar & Grill, order the chicken fried steak. Or, pork chops smothered in their homemade jalapeno peach jam next to a side of calf fries. For dessert, indulge in warm pecan pie topped with house-made whipped cream. During your meal, you can enjoy live entertainment. If you’re lucky, Toby Keith himself will drop in for an appearance. He’s been known to delight guests with surprise performances. Play a banjo over at the American Banjo Museum. After you’re done learning all about it’s origins and history, of course. Did you know first evidence of a banjo can be dated back 6,000 years? There’s many more fun facts to uncover during your visit. 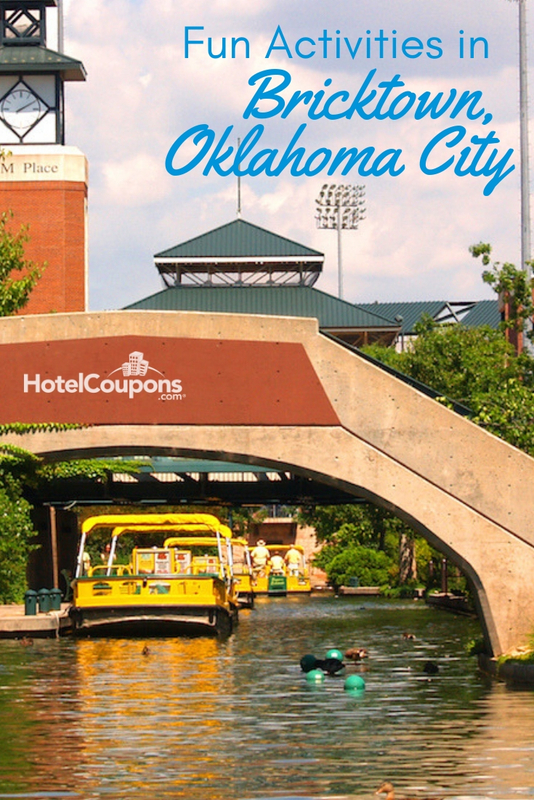 Have fun on your trip to Bricktown. Are you from the area, or are you visiting? Let us know in the comments. If you’re from out of town and looking for a good hotel deal- try our sister site, Hotelcoupons.com.